MXL is one of the leaders in the vocal tech industry, and we are going to compare two of their finest models – the MXL 770 and MXL 990. Namely, both of these microphones boast high qualities and a remarkable value for the cash due to a premium-quality feature outfit and off-the-charts performance levels. We’re going to discuss how these microphones perform, who are these microphones ideal for and decide the winner at the end. Size 59mm x 158mm / 2.32 in. x 6.22 in. 60mm x 130mm / 2.36 in. x 5.11 in. Generally, MXL implements high-level engineering combined with exceptionally great construction materials, and both MXL 770 and 990 are a true sight to behold. Both are condenser-type mics, and they’re ideal for professional musicians, as well as casual singers who want to enjoy a true music experience. Essentially, the MXL 770 is a high-quality condenser microphone that comes outfitted with a low-noise preamp, allowing for a well-balanced output and performance. On top of that, it doesn’t cost too much (a couple of bucks cheaper when compared to MXL 990), and you’ll be able to reap the benefits of superb bass and vibrant mids, even though the highs are a bit over the edge for comfort. All things considered, you’ll be glad to hear that this little microphone comes with a bundle of complementary accessories, which include a strong & durable case, a terrific shock mount, and a handy user’s manual. People tend to love the MXL 770 right out of the box – this little microphone is fairly inexpensive and comes supplied with everything you need to start recording or singing right away. The MXL 990 features a similar (patented MXL) design when compared to the MXL 770. On top of that, there are certain features that these microphones have in common, such as the FET preamp and the custom shock mount accessory. Overall, the MXL 990 is just slightly more expensive than MXL 770, even though the difference isn’t substantial in any way. The build quality is somewhat enhanced with the 990, given that the materials are pretty much the same, with the exception of champagne-colored vintage finish. Just like the 770, the MXL 990 is intended for professional use, but it’s safe to assume that everyone can and should use it, for as long as you’re the person who values quality above all. Both MXL 770 and MXL 990 feature a nearly-weightless body type – the 770 weighs a pound while the 990 weighs a pound and half. Furthermore, both of these microphones look absolutely ravishing – while the MXL 770 features an elegant “black with black grill” finish, the MXL 990 features a stunning “champagne” finish. What’s more, these microphones feel incredibly durable, despite the fact that the majority of their construction features plastic materials. Of course, if you intend to use the vast array of accessories at your disposal, you can completely eliminate the threat of potential damages, making the issue of durability pretty obsolete and unnecessary. Again, the lightweight qualities of these microphones significantly increase the range of their versatility. You can utilize this benefit in a number of ways, as you can consider singing, recording, concert-taping, or similar activities without having to choose between holding the mic or placing it on a stand – either way will be just fine. Before we begin comparing the sound and performance of MXL 770 and MXL 990, it’s important to note that the MXL 990 sounds a bit better overall. Namely, this model features a well-balanced soundstage that’s characterized by a rich tone and unparalleled bass output. 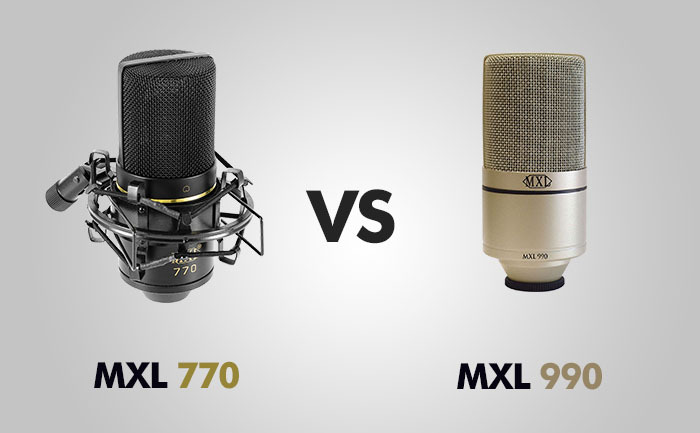 That doesn’t mean that MXL 770 is inferior, though – it simply excels in different spheres of performance. Generally, both the MXL 770 and the MXL 990 sound terrific – while the 990 features a heavily accentuated bass undertone and a rich, balanced soundstage, the 770 offers clarity without fail. Note that both microphones are recommended for professional use, and you can rest assured that you’ll have no issues with the sound and performance for as long as you utilize them in a proper way (consult the manual for accurate information on how to do so). The first most notable feature of both MXL 770 and MXL 990 is the FET preamp devices, while the second is the transformerless output. This combination of features allows for a wide dynamic range, completely eliminating buzzing and feedback. PROS: Cheaper than MXL 990 / Affordable overall by high-end mic standards / Superb tonal qualities and sound clarity / Lightweight construction / High versatility rating / Comes with a number of complementary features. PROS: Unparalleled sound quality / Rich, well-balanced tone / Remarkably beautiful outward appearance with a “champagne” finish / Superb overall value for the price / Highly affordable for a high-end microphone. CONS: Mediocre durability / The MXL 990 is slightly better regarding the sound output. CONS: Comes outfitted with a strikingly similar set of features when compared to MXL 770 / Certain parts aren’t as durable as the rest of the construction. Pitting MXL 770 against MXL 990 is a tough job, given that both of these microphones are pretty amazing overall. However, I think that the MXL 990 is the victor, given that it sounds a bit better, and offers more option in general. However, let’s not neglect the fact that MXL 770 is pretty amazing as well – it’s surprisingly affordable for a professional microphone, and it offers such a level of performance that’s unprecedented within the price range.